You may recall my pic posted last month of the next door building which is being brought down. 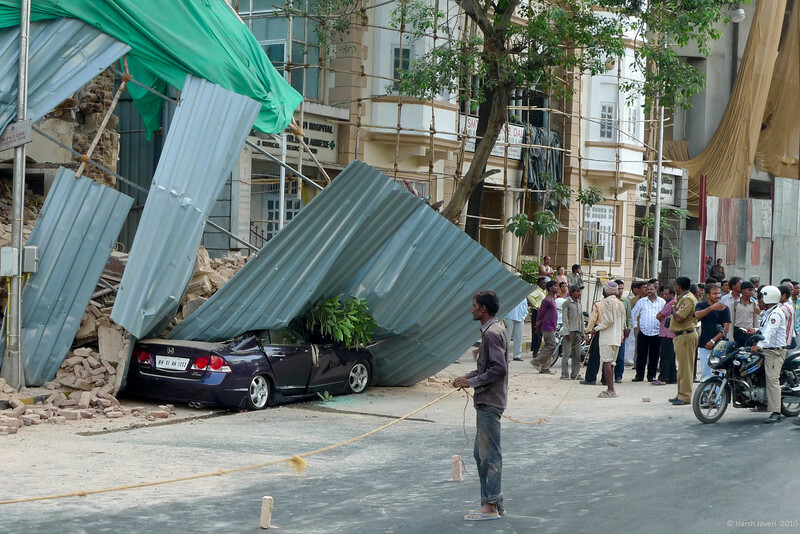 Today a part of the broken wall collapsed and crashed, along with the tin screens; on a Honda Civic. The car was a total loss but the driver escaped miraculously with a slight bruising. I live, on the ground floor of the next building. Oh my, what a shot! Yikes! Glad the driver was unhurt. Scary to have this happen so close to home! Glad the driver is ok.
OUCH! hope he's in good hands with allstate! What a lucky escape from an unfortunate accident. I hope your building is ok.
Wow... what a great PJ photo - incredible! Good that the driver escaped!